Let the collections at House of Terror Museum and Hospital in the Rock capture your imagination. Get in touch with nature at Margaret Island and Priest's Island (Pap-sziget). There's lots more to do: don't miss a visit to Fisherman's Bastion, identify plant and animal life at Sas Hill Nature Reserve, and take in the spiritual surroundings of Dohány Street Synagogue. Plan a trip to Budapest easily and quickly by telling Inspirock to suggest an itinerary. Lisbon, Portugal to Budapest is an approximately 7-hour flight. You can also drive; or do a combination of bus and train. Traveling from Lisbon to Budapest, you'll lose 1 hour due to the time zone difference. In July, daily temperatures in Budapest can reach 33°C, while at night they dip to 18°C. Wrap up your sightseeing by early afternoon on the 14th (Sun) to allow enough time to drive to Bled. The most popular resort in Slovenia, Bled is marked by its iconic church steeple and medieval castle on glacial Lake Bled. Start off your visit on the 15th (Mon): explore the historical opulence of Bled Castle (Blejski Grad), then take in the spiritual surroundings of Pilgrimage Church of the Assumption of Maria, and then contemplate the waterfront views at Lake Bled. To find reviews, ratings, maps, and other tourist information, read our Bled trip maker . Drive from Budapest to Bled in 5 hours. Alternatively, you can do a combination of flight and bus; or do a combination of flight, shuttle, and bus. July in Bled sees daily highs of 32°C and lows of 17°C at night. Wrap up your sightseeing on the 16th (Tue) to allow time to drive to Ljubljana. The capital of Slovenia, Ljubljana melds German, Mediterranean, and Slovenian culture and history. On the 16th (Tue), test your team's savvy at Ljubljana Castle, take in the exciting artwork at Galerija Fotografija, then examine the collection at National Museum of Contemporary History (Muzej Novejse Zgodovine Slovenije), and finally explore the galleries of Loški muzej Škofja Loka. Get ready for a full day of sightseeing on the next day: contemplate in the serene atmosphere at Franciscan Church (Franciskanska cerkev), take in the spiritual surroundings of Cathedral of St. Nicholas (Stolnica Sv. Nikolaja), then ponder the world of politics at Town Hall (Magistrat), and finally glide through the air with a parasailing or paragliding tour. For maps, where to stay, traveler tips, and tourist information, read Ljubljana journey tool . Traveling by car from Bled to Ljubljana takes an hour. Alternatively, you can take a train; or take a bus. In July, daily temperatures in Ljubljana can reach 32°C, while at night they dip to 17°C. Wrap up your sightseeing by early afternoon on the 18th (Thu) to allow enough time to drive to Zagreb. Zagreb boasts a combination of Austro-Hungarian and Socialist architecture, but it is beloved for its outdoor cafe culture. Start off your visit on the 18th (Thu): examine the collection at Zagreb 80's Museum and then see the interesting displays at Museum of Broken Relationships. Get ready for a full day of sightseeing on the next day: take a memorable tour with Tours, then contemplate in the serene atmosphere at St. Mark's Church (Crkva sv. Marka), and then get to know the fascinating history of Upper Town (Gornji Grad). To find reviews, maps, traveler tips, and tourist information, you can read our Zagreb travel itinerary planner . You can drive from Ljubljana to Zagreb in 1.5 hours. Alternatively, you can take a shuttle; or take a train. In July, daytime highs in Zagreb are 34°C, while nighttime lows are 18°C. 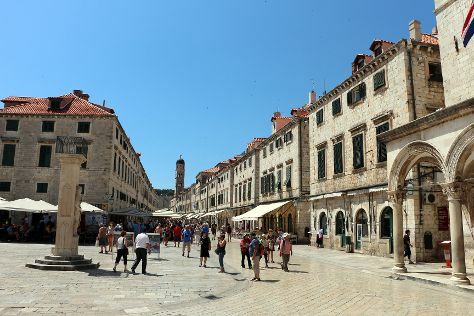 Finish up your sightseeing early on the 20th (Sat) so you can travel to Dubrovnik. Along the Dalmation Coast, the city of Dubrovnik has become famous for its pedestrian-only Old Town surrounded by fortress walls, and its historical heft has earned it World Heritage Site status. On the 21st (Sun), step off the mainland to explore Island of Lokrum and then take a stroll through Old Town. Here are some ideas for day two: examine the collection at War Photo Limited, then take an in-depth tour of Rector's Palace, and then paddle through the water with a kayaking and canoeing tour. Discover how to plan a Dubrovnik trip in just a few steps with Inspirock's itinerary builder. Fly from Zagreb to Dubrovnik in 3 hours. Alternatively, you can drive; or take a bus. Traveling from Zagreb in July, Dubrovnik is somewhat warmer at night with lows of 24°C. Wrap up your sightseeing on the 22nd (Mon) to allow time to drive to Sarajevo. Nearly destroyed by war during the 1990s, the riverside city of Sarajevo now serves as one of the region's major educational, cultural, and commercial hubs. Kick off your visit on the 23rd (Tue): contemplate in the serene atmosphere at Gazi Husrev-beg Mosque, get engrossed in the history at Museum Of Crimes Against Humanity And Genocide 1992-1995, steep yourself in history at Sebilj Brunnen (Fountain), then pause for some serene contemplation at Church of the Holy Archangels Michael and Gabriel in Sarajevo, then take an in-depth tour of War Childhood Museum, and finally admire the masterpieces at Galerija 11/07/95. For more things to do, where to stay, reviews, and more tourist information, refer to the Sarajevo trip maker site . Traveling by car from Dubrovnik to Sarajevo takes 4 hours. Alternatively, you can do a combination of car and train; or take a bus. Traveling from Dubrovnik in July, plan for slightly colder nights in Sarajevo, with lows around 16°C. Cap off your sightseeing on the 24th (Wed) early enough to travel back home.